The Ski Vermont Specialty Food Tour will visit alpine and cross country ski areas across the state this season. 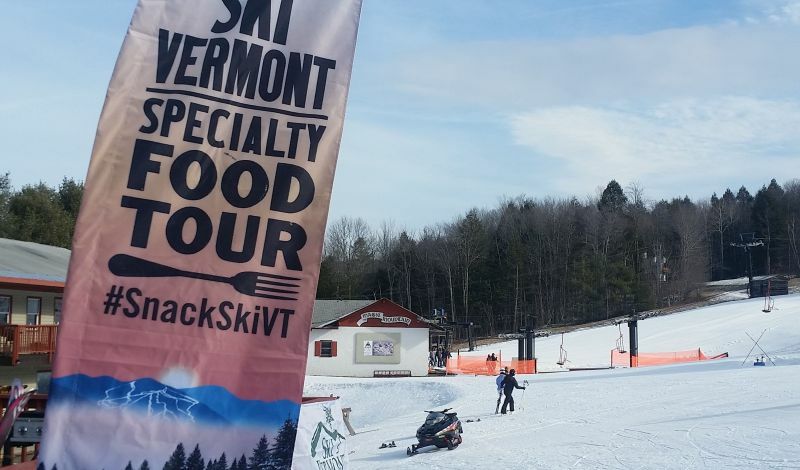 The Vermont Ski Areas Association will once again help deliver a taste of the Green Mountain State to ski areas this winter by offering skiers and riders samples of a variety of treats and libations at scheduled stops on the Ski Vermont Specialty Food Tour. Well-established Vermont landmark products available include Cabot award-winning cheddar cheese and Ben & Jerry’s ice cream. Additional Vermont specialty food producers including Barr Hill Distillery, Silo Distillery, Mad River Distillers, Ambrosia Chocolates and Confections, West River Creamery, goodMix Superfoods, MOCO Hot Cocoa, Vermont Barrel-Aged Hot Sauce, Kimball Brook Farm, Wood’s Syrup, It’s Arthur’s Fault, Vermont Maple Granola, Garuka Bars and SAP! will join the tour to showcase their assortment of products. The combination of unique foods and beverages and the distinctive settings of Vermont ski areas adds to the allure of the events. “Our guests are always thrilled to be able to taste and purchase local products slopeside, while still in their ski or snowboard gear,” said Adam Rowe, marketing manager for VSSA.